One of my best friends and I were talking last night. I mentioned the fact that guilt is a powerful thing. 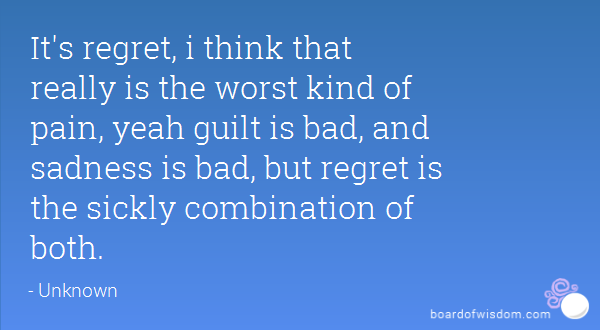 He said, “Yeah, but regret is worse.” I started thinking.. he is probably right. See, guilt can be positive and negative. You actually might stop doing something out of guilt. Regret, well, that can’t be changed or taken back. It is what it is. Have you ever dealt with either or? I try not to do things that make me feel guilty. I try not to judge others and cause them to feel guilty, either. I have a problem with some of the preachers today who teach and heap guilt on folks. Are we all sinners? Well, yeah. Do we all fall short? Well, yeah. Leave the guilt behind. It’s not worth it if it’s hurting you. Now, let’s say you smoke… and you feel guilty about it. Stopping it will be beneficial for you. Let’s say you feel guilty but do not stop. Then you get lung cancer. There isn’t anything you can do about it at that point. So…. let the guilt be a good tool for you. Don’t do things out of it that aren’t positive. Do not hurt others by making them feel guilty or anything else. Live your life and treat people the way you want to be treated. Maybe that will get rid of all the guilt and then there will not be any room for regret. Do you have a dream that haven’t been fulfilled yet? DO SOMETHING! You don’t want to regret it later. ← Are you holding on to unforgiveness? ?